Our Electric Fireplace Ultimate Buying Guide is designed to offer the best electric fireplace buying suggestions for various needs. Other sites might give you recommendations for the ‘best electric fireplace’, but is it REALLY the best? Checking out any of our individual reviews will assure you WE have done the exhaustive research and are not simply rehashing product descriptions. Don’t worry. We’ve got you covered. Keep on scrolling down until you hit the category you are most interested in. If you know what type of electric fireplace you want, the biggest decision might be one of choosing the right style for your decor. These are all great units and perform well, so browse with confidence. What Is The Best Electric Fireplace? Compare ONLY the 3 Best Electric Fireplaces of each type by CLICKING the ‘More Info’ Button below the pictured type of fireplace you are interested in. You will go right to our Top 3 Picks. What Type Of Electric Fireplace Is Best For You? This section of the electric fireplace guy buying guide is designed to help you arrive at the perfect electric fireplace that will meet all your needs and desires. ✅ TIP: Heating output is pretty much the same on all electric fireplaces with forced air heat manufacturers state ‘supplemental heat up to 400 ft.². The EXCEPTION are Infrared forced heaters for which ‘supplemental heat up to 1,000 ft.² is the standard. By answering a set of simple questions you can get clear on what you expect from an electric fireplace. Of course, our job is to provide you with the best information available recommend that perfect electric fireplace. Why Are You Buying An Electric Fireplace? People tend to buy electric fireplaces for one of the very few simple reasons. Determining your preferences will steer you toward the correct fireplace for you. Are you primarily looking for soothing ambience generated by realistic flame effects? All electric fireplaces produce flame effects in varying degrees of realism and can be operated without the heating function. A simple room focal point might be either an electric fireplace mantle, or a wall-mounted electric fireplace.Some fireplace manufacturers kick up their flame effects a notch. They offer back lighting, side lighting, and different color flames. If this is your style you might be interested in ClassicFlame Fireplaces. Other manufacturers are more interested in producing a realistic depiction of a burning fire. Southern Enterprises is very traditional and Dimplex fireplaces can be a bit traditional or have special effects. Are you primarily concerned with the supplemental heating provided by an electric fireplace? Electric fireplaces in their heating functions can generally be divided into two groups. Regular forced air heaters or infrared is. There is pretty much an industry standard for each type of heater. Search for Infrared Electric Fireplaces Manufacturers claim a regular forced air heater will provide supplemental heat up to 400 ft.². They claim and infrared heater will heat up to 1000 ft.². If you need more heat look search for Infrared Electric Fireplaces. They are available as wall mount electric fireplaces, electric fireplace inserts, mantels and entertainment centers. Are you looking to improve the functioning of a room possibly by incorporating a fireplace in twin media, entertainment center, or utilize it as a TV stand? 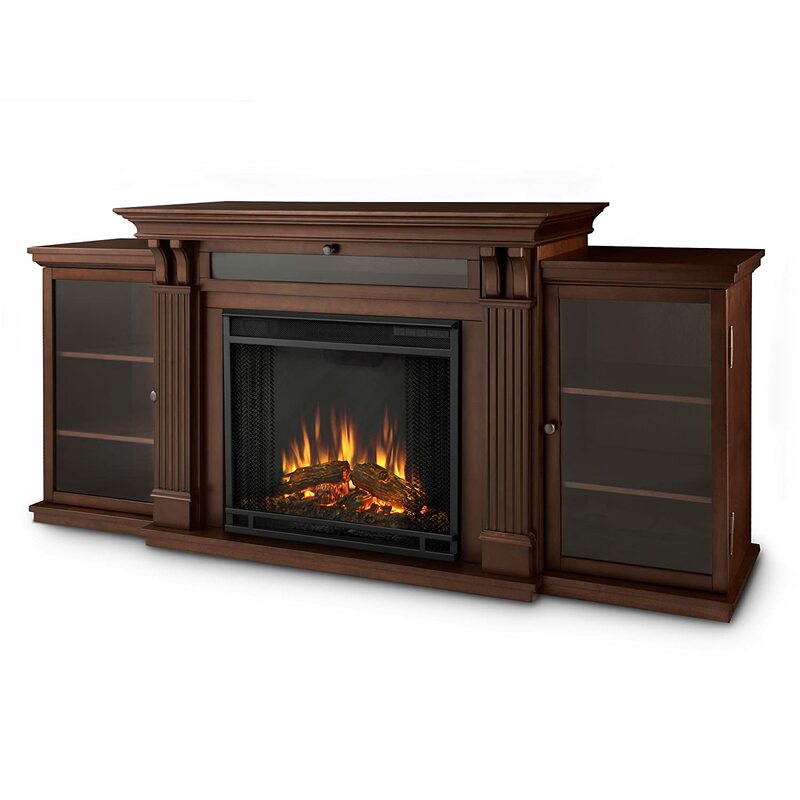 Electric fireplace entertainment centers come in all shapes and sizes. Don’t just go by the picture of the entertainment center. A space-saving option is corner electric fireplaces and corner electric fireplace media centers. 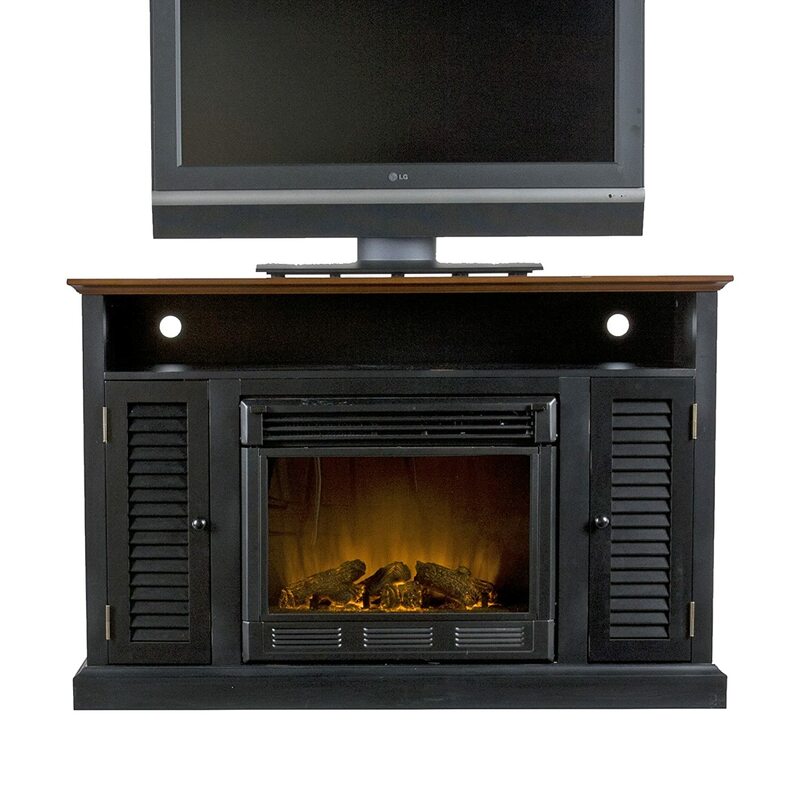 Here are some images of electric fireplace entertainment centers. ✅ TIP Get the dimensions of the fireplace you are considering, Use tape or tacks and some string to layout the size and site of where you want to put it BEFORE buying (especially for wall mount fireplaces). Images provide can make small fireplaces appear large and vice versa. ClassicFlame1. ClassicFlame We love ClassicFlame electric fireplaces because their patented ‘Spectrafire’ flame effects. They are our top pick for Best Electric Fireplace Brand. Most come with a multi function remote which offers you the ability to customize your electric fireplace with 125 selectable flame effect options to create the perfect mood and ambiance for any style. Or choose auto cycle then sit back and enjoy as the different flame effects rotate through. Dimplex2. Dimplex They primarily manufacture heaters. In fact, they are one of the world’s largest manufacturers of electrical heating. They had to develop flame effect technology. Dimplex electric fireplaces higher end fireplaces have truly outstanding flame effects. They became the first company in the fireplace industry to create a genuinely realistic “wood burning” flame effect. Stick to upper end Dimplex products. Real Flame3. Real Flame Real Flame electric fireplaces has 30 years in the industry. Their flame technology utilizes LEDs and feature a dynamic ember effect which makes them realistically mimic the actions of real fire. All of Real Flame electric fireplaces we have seen feature a programmable thermostat and an operation timer of up to nine hours, allowing the units to be fully customized and tailored to your preferences. Click For Images Of Real Flame Electric Fireplaces. 4. SEI Southern Enterprises Inc. SEI is primarily a furniture and home décor manufacturer. frankly, we LOVE their designs. They specialize in traditional mantles and media centers. Their designs and quality of construction are outstanding. In speaking with customer service, I learned that they primarily use 2 fireboxes: traditional and infrared. The fireboxes are well received. What changes is the beautiful cabinetry that are the surrounds. Southern Enterprises electric fireplaces are extremely well reviewed and received by buyers. 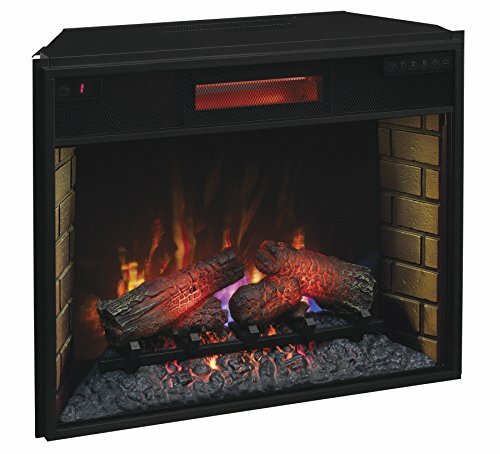 Click For SEI Electric Fireplace Discounted Prices. Wall mounted electric fireplaces are perfect for creating a stunning focal point in any room. They have been described as ‘art in motion’. When thinking of placement, think of anywhere you would hang art to fill a blank wall space. There are linear fireplaces in many colors and styles. Create your own fashion forward decor statement. They are available in many sizes from small to huge. Electric fireplaces also generate supplemental heat. The flames can be operated without the heat on. You control flame effect media options, glass, logs, rocks or other decorative material. ✅ NEW POST UPDATE: Check out our quick look at 10 budget (cheap) electric fireplace TV stands all UNDER $250. There were some surprisingly stylish and good quality fireplaces revealed. Form and Style After all, it is a piece of furniture does it go with your decor and is it pleasing to the eye. This will be a centerpiece and a focal point for lots of activity in viewing. Function: Make sure the fireplace will accommodate the width of your TV and there are not shells and storage to accommodate your DVD player, cable box, etc. Value: most people are always looking at the bottom line. How much does it cost? This might be a purchase where it makes sense to stretch a little bit. Go for higher quality and a better look. After all, a great deal of your attention will be focused on it. The media center is a hub for family activity. They are room focal points. The electric fireplace adds some Pizazz. They keep your electronics ordered and stylishly displayed. Flat screens can set on, OR be wall mounted above the unit, keeping electronics close by. They come in a million different styles to fit any decor. 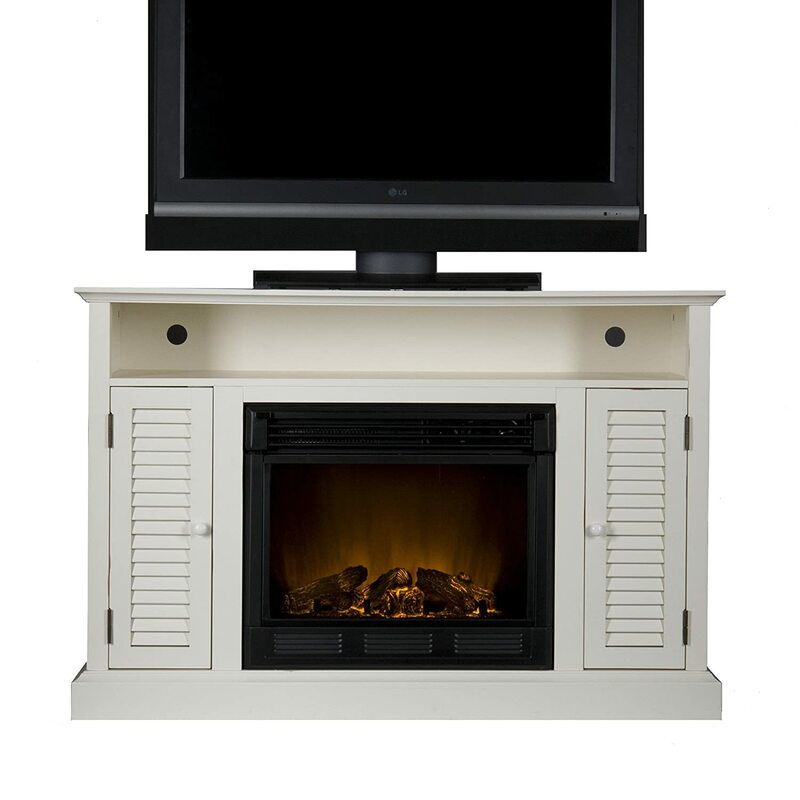 Electric fireplace TV stands and entertainment centers give you bang for your buck. You control flame effect and heat with a remote control. Click on the Image for current discounted price. Click for Full Review Of The Altra Electric Fireplace Entertainment Center. Click for Full Review Of The Calie Entertainment Center by Real Flame. Click for Full Review Of The Narita TV Stand by Southern Enterprises. If those didn’t grab you – CHECK OUT these for size and styling. 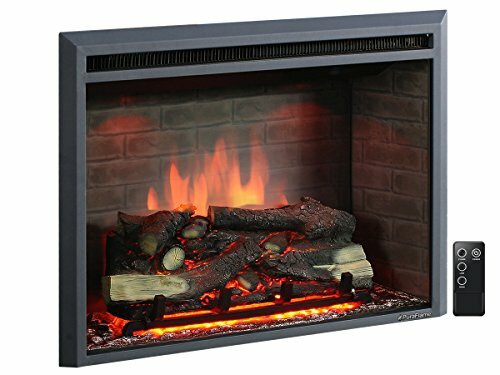 ✅ This particular wall mount electric fireplace is the most popular with our readers, and it is an Amazon Best Seller. It’s a wall hung electric fireplace, yet you’ll also find that it is also one of the best values you’ll find online. It has hundreds of reviews, many are 5 stars. we keep an eye on the price and if it is under $280, grab it. Check out the Warehouse deals for even more savings. Click the images below for the current discounted price and buyer reviews for the black, white and flush mount – fully recessed versions. ✅Are You Looking For The Best Electric Fireplace Mantel? If there is no existing fireplace opening in your house, and you want to add a room focal point and electric fireplace mantel just might be interested in this option. The selection of an electric fireplace mantel is mostly one of taste. So it is impossible to pick a ‘best’. Stick to the top 4 brands we mentioned and you can be comfortable in getting a good firebox. Function being taken care of the rest is just form and taste. Huge array of fashion forward finishes and colors, styles and prices. Match any décor from traditional, to mid-century modern. Easy installation, assemble, plug and play. Great for renters or those who move frequently, if you move or want to change rooms, just take it with you. Also Available as slim electric fireplaces. SaveMany people would love to have our fireplace in their home but the construction, cost, and hassle of maintaining a traditional fireplace have pretty much rule that idea out. Now there is a wonderful alternative, electric fireplace mantels. There are two parts to an electric fireplace mantle, the firebox, which consists of the flame effects screen and heating elements and then the furniture surround, the mantel. Electric fireplace mantels, after assembly, are largely plug-and-play. You do not have to excavate a hole in your wall. Depending on the model they can either be mounted against an existing wall (without a cut out) or you can purchase a convertible corner electric fireplace mantel. Being a’ convertible’ means it can be mounted flat against a wall or in a corner. There is a triangular flap in the back that can be raise or lowered for fit. ✅ Check the price on This particular electric fireplace stove. It is the the best one we have found, and comes in glossy black or glossy cream. It is the ONLY one we’ve found with a purifier air treatment system which filters airborne allergens and particulates. Space saving size, great for small spaces. Easy installation, take it out of box and plug it in. Extremely low running costs – 2-4 cents/hour on flame only, 8 to 10 cents on flame+heat. Great for renters or those who move frequently, if you move or want to change rooms, just pick it uptake it with you. Run it year round for a cozy ambiance. Flames can run without heat on. For some reason these freestanding electric stoves evoke a mood of coziness and snuggliness ( I know that isn’t a word), but hey, that’s what it feels like to me. These freestanding electric stoves are really attractive stoves are an attractive way to generate some supplemental heat. They are the epitome of plug-and-play. They use a standard 120 volt household outlet and are much cheaper to run than a gas fireplace and with much less hassle than a wood-burning fireplace. 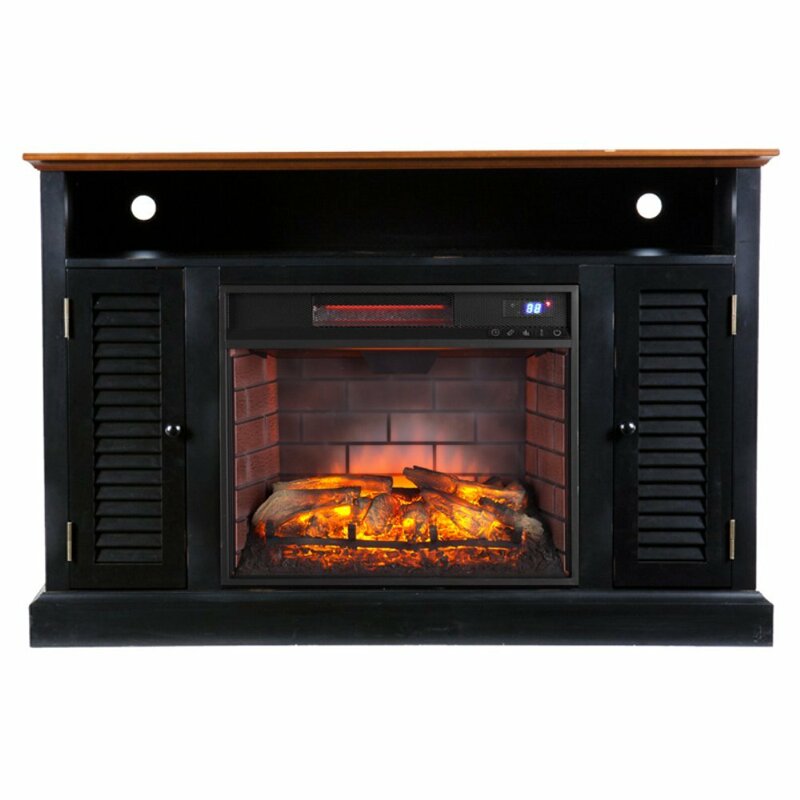 ✅ Check the price on This Best Selling electric fireplace insert. It is a great value and the best we have done a full review on. It is the most popular fireplace insert with our readers and is an Amazon Best Seller – it comes in various widths. Finally making use of your built in fireplace. No smoke, off-gassing or clean up. Once again use your fireplace as a room focal point. This may be the best little ✅ Portable Electric Fireplace Heater for an RV, trailer or anywhere if space is at a premium. We check prices regularly – and if is under $75 you are getting a GREAT deal. Dimensions: 11.1″ Wide x 7.72″ Depth x 13.98″ Height. Available in your choice of 3 colors: red, black, white. Flame effect can be used with or without heat. Portable mini fireplace heater; 100% LED lit coal flame effect. Plug and play – pick up and go – great for Zone Heating. Supplies supplemental heat for up to 400 sq. ft. Using this little guy in an RV can save money on propane costs.Back handle design, easy to move and transport. Ideal for use in cottage, trailer, home, office, dorm, or anywhere an extra temporary heat source is needed; Only 120V, 2 pronged plug. One year warranty. Why Are YOU Looking To Buy An Electric Fireplace? Electric fireplaces provide flame effects that create a desired look or ambience in a room. Electric fireplaces also provide supplemental heat very efficiently to virtually any space. Which aspect is more important to you depends upon personal taste and needs. We live in Florida so the flame effects and décor factor were WAY more important than heat. Different fireplaces have different strengths in different areas that’s where a knowledgeable buying guide and comprehensive reviews can guide you. How realistic are the flames? Thankfully, technology has increased dramatically to make the flame effects extremely realistic in recent years. Gone are the days of an electric fireplace looking like a flashlight being shined on aluminum foil. Most people have difficulty distinguishing electric fireplace flames from those of a gas fireplace. Modern electric fireplaces use different types of technology that are often patented by the manufacturers. The use of LED lighting, rear projection, and the use of prisms are common. Do I want the option for special colored effects such as back-lighting and non- traditional flame colors? Our detailed reviews tell you what to expect the fireplace. Electric fireplaces can be run as with or without the heat on. If the heat is off it costs no more to run than a typical incandescent light bulb. Do electric fireplaces provide heat? The answer to that question is yes electric fireplaces provide heat. However, it is best to think of them providing supplemental heat. If you think they will replace your primary heating you may be disappointed. The first advantage of using an electric fireplace as supplemental heating is that it is the most efficient and least expensive option out there. It is 40 to 50% cheaper than gas. Portable and infrared electric fireplaces are wonderful for implementing a Zone Heating Plan. Basically, you set your thermostat for the house at a much lower temperature and use the electric fireplaces to keep those rooms you actually use. 1.Forced air heating mechanism. Blows air heated over a coil into the room. A standard forced air electric fireplace is generally designed to provide supplemental heat for up to 400 ft.², no more. Some may struggle at that. That is standard for a standard (non-infrared) electric fireplace. All in all they provide the same amount of heat. This limitation is not one of the fireplace, any brand or manufacturer, but rather of what a standard household plug and circuit can handle. The maximum we have seen is 5200 BTU’s Any more load than that and you would be blowing circuit breakers and melting wires. In the case of forced air heating, air is heated up by a heating device in the fan blows it directionally out in the room. They work well in an enclosed room (such as a bedroom), but if placed in open concept free flowing rooms their heating effect may be marginal. 2. Infrared heating mechanism. These heat the room by transferring heat straight to objects in the room. It heats up the objects in the room rather than blowing hot air into it. Infrared heaters will provide supplemental heat for up to 1000 ft.² on a standard circuit (versus 400 ft.² with a forced air heater). It is a different type of heat, however. Infrared electric fireplace heaters provide a more even heat. Infrared heaters provide soft heat and stay cool to the touch, so they are safe to operate around children and pets. Check out the discounted price on our pick for the ✅ Best Electric Fireplace Heater.We keep an eye on prices because they can vary. If today’s price is under $200 – snap it up. It is a GREAT DEAL. The reality is that almost all standard electric fireplaces produce the same amount of heat. This is not necessarily by choice of the maker. The amount of heat provided is limited by what a standard electrical outlet and circuit in a home can handle. If you check the specifications on electric fireplaces you will see something like this with very little variation: 120V/60Hz, 1500W, 12.5 Amps 5,000 BTU’s. The measurement of heat produced is in the BTUs number which, with slight variation will be around 5000. They almost invariably claim to be a supplemental heat source for”up to 400 ft.²”. So how do we determine the best electric fireplace for heat? 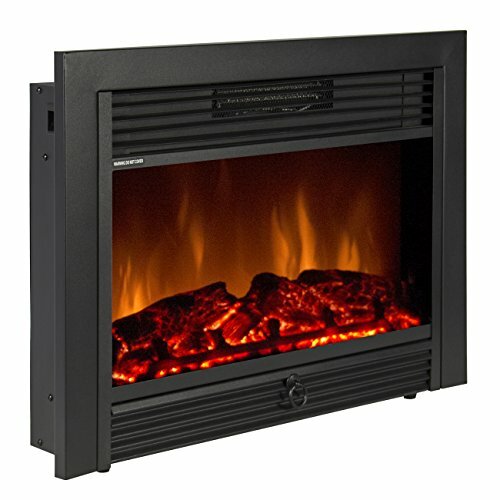 Duraflame Infrared Rolling Mantel, 20IF100GRA-C202Get More InfoWe started with choosing an infrared heat electric fireplace. While the electrical requirements might be about the same, due to the different type of heat being produced, they can provide a supplemental heat source for up to 1000 ft.². Among infrared electric fireplace heaters they are pretty much all the same in terms of heating ability. The difference being they can heat a larger amount of square feet than standard electric fireplace heaters. 1,000 sq. ft. vs 400 sq.ft. So with heating capacity of different fireplaces in the infrared class being equal, our choice for the best electric fireplace rests with utility and ease-of-use. 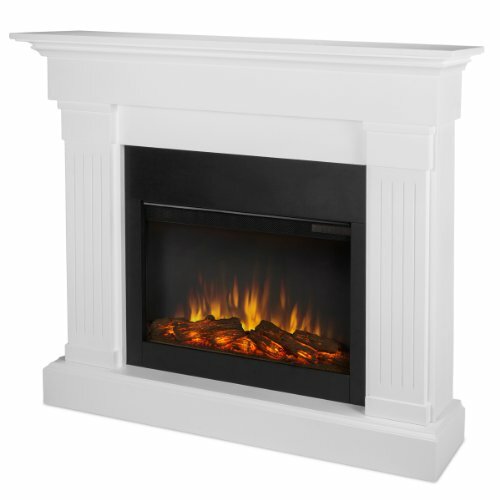 We LOVE the ClassicFlame 23IRM1500-O107 Rolling Mantel with Infrared Quartz Fireplace. which is pictured above. A close contender and another option is the Duraflame Infrared Rolling Mantel, 20IF100GRA-C20. This has roller wheels also. We love these for their its utility and the ease-of-use. Take the heat to where you want it. Unplug it, roll it into another room and plug it back in. How easy is that? It is great zone heating or ‘pre-heating’ a bedroom or TV room prior to use. Great strides have been made in technology in producing realistic flame effects. Generally the set-up is simple. The decor and design possibilities of electric fireplaces are almost infinite. It is virtually certain you can find a fireplace to meet your homes’ existing decor while creating a fashion forward focal point for any room. A huge benefit from these units is that they can have a much longer life span than other types of fireplaces. There are no actual flames that are burning combustible fuels. This means that degradation and corrosion of parts by caustic agents is nonexistent. The electric fireplace heater dissipates warmth directly into the room and is not lost through the chimney or special venting, since they don’t require any. They make implementation of a zone heating plan simple. When it comes to electric fireplace safety, a huge benefit is that they do not emit any harmful gases and fumes such as carbon dioxide and carbon monoxide. Electric fireplaces are the most efficient. Electricity converts directly to heat with a 99% efficiency. This compares very favorably to 60-80% efficiency with gas fireplaces. Electric fireplaces are less expensive than either a wood fireplace or a gas fireplace both in installation costs and running costs. If the power goes out – so does the fireplace. Depending on the fireplace selected the flame effects won’t be the real thing, no smell, no fire cracking sounds. Since they are portable, they will not add value to your home at resale. Electric fireplaces are meant to be supplemental heat, not primary. Regular units will heat 400 sq.ft. – infrared 1,000sq ft.
✅ These Traditional Electric Fireplace TV Stands by SEI are worth a quick look. They are well made with a good firebox. They are VERY popular and well reviewed. The function and decor of the entertainment center surround. There are hundreds of styles and variations to match any decor. Most centers allow you to place a flat screen TV on top. Another possibility (especially for wide TV’s is to wall mount the TV and center the media center below it. If you don’t have a lot of wall space look for a corner electric fireplace entertainment center. The electric fireplace firebox (heater and flame effects). You should not get completely carried away just by style. Make sure that the flame effects are good and you will get the heating coverage you want. SEI uses a nice firebox and this furniture maker has some wonderful designs. Stick to our recommended name brands – Southern Enterprises Inc (SEI), ClassicFlame, Dimplex and Real Flame. What follows in the balance of this post are images and links to our COMPREHENSIVE electric fireplace reviews. We are very proud of the detailed research that goes into them in order to help you make a more informed buying decision. They are grouped by fireplace type. Scroll On Down and enjoy. This SEI Antebellum Media Electric Fireplace Media TV Stand review will focus on the features of this fireplace and the overall benefits that owning this unit will bring to you. Important Note: This fireplace is available in 2 finishes, but 3 versions: 1. Black with walnut trim, 2. Antique White, and Black/walnut trim Infrared . The black model is available with regular heat or infrared. In the images below the infrared is on the far right. Our honest and comprehensive review features both the pros and cons of this electric fireplace TV stand. We always want you to have all of the facts before you decide to make a purchase so the buying decision is an informed one. This traditionally designed fireplace, which has media storage functionality as well, will look the part in your home. SEI – Southern Enterprises Inc is primarily a furniture company. Their focus is building good looking furniture with quality construction. 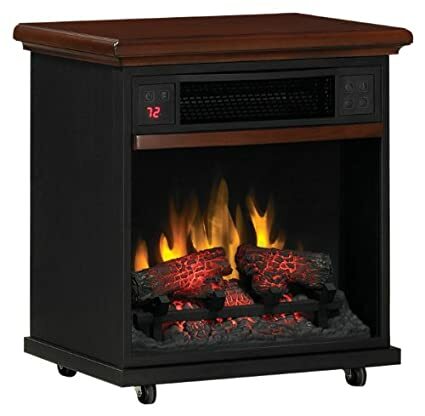 This electric fireplace heater is good looking and traditional enough to find a place in either your home or office. It will be a room focal point for sure. With its natural looking logs and flame effects to its efficient infrared heater, this fireplace will add ambience and coziness as well as functionality to any room. In addition to our comprehensive written electric fireplace reviews, we invite you to click through to our YouTube Channel for our video reviews.Each review is brief, about 2 minutes and to the point. The glowing embers and the flickering flames of this fireplace look pretty realistic even close up. There are no fancy colors or special effects found on some very contemporary linear electric fireplaces. The aim here is for natural flame realism. The interior of the firebox simulates brick which not only looks nice but gives the illusion of more depth than the actual 15″ inches. There is mood lighting that can be switched on or off to enhance the brick effect of the firebox. Flame intensity has six level controls (the last being turning the flames off) and the intensity of the logs can be controlled in the same way.The ability for multiple flame effect adjustments is really important for setting the mood and ambiance of the room to fit different needs and situations. There is tempered glass at the front of the fire box and this should never be hot to the touch so young children will always be safe and so will your pets. Long life LED’s provide the power for the flames and crisp effects. The bulbs should not need replacement. On the black model the infrared will heat a larger space. If you are not familiar with the pros and cons of infrared heat: Click Here Infrared Heat Explained. This fireplace has a quartz heating element which provides fan forced heat that is very efficient. You will be able to adjust the temperature of the heater from 62° Fahrenheit to 82° Fahrenheit using either the remote control or the manual buttons. You should be able to heat up any room up to 400 sq ft in around 20 minutes with this fireplace no matter how cold it is outside. You can set the temperature and when the room temperature falls below this level the heater will turn on automatically. A fan is used to distribute the heat around the room. The fireplace comes with a 6 feet long power cord which plugs into a standard 120 volt outlet. Its maximum output is 5000 BTU’s at 1500 watts. I believe it is very important that everyone purchasing an electric fireplace heater be aware of the limitations of these units. Quite simply they will not heat your whole house. This is not a downfall of any particular fireplace heater. The limitation is a function of how much power and electricity can be pulled through a standard household circuit and outlet safely. It is true for almost all electric fireplace heater components. We confidently and exclusively refer our readers to Amazon. Their prices can hardly ever be beat, they offer outstanding service, fast, and safe shipping (usually free). The Antebellum Media Electric Fireplace can be controlled using the manual buttons that are situated at the top right of the fire box or through the full function remote control that is supplied. The fireplace can be turned on or off and the LCD display will indicate the current room temperature. 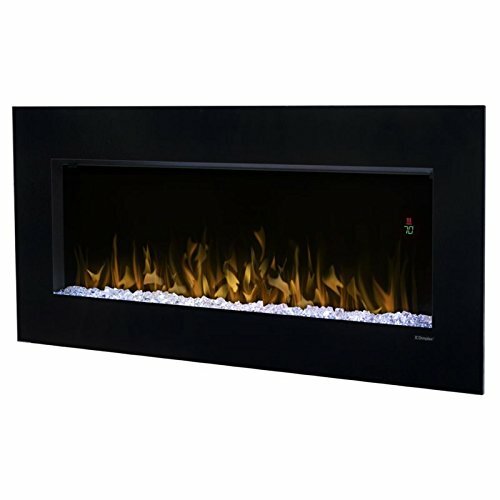 The mood lighting can be turned on or off and the flame intensity and intensity of the embers can be adjusted with controls on the firebox or the remote. The fireplace has a timer, and the control buttons can be used in manual mode to turn the heater off after a period of time. The heating can be programmed from half an hour right up to nine hours. The controls can also be used to change the temperature display from Fahrenheit to Celsius and vice versa. The overall dimensions of this fireplace are 48 inches wide by 15 inches deep and 32 inches in height. The firebox measures 23 inches in width by 20 inches in height. The open shelf is 43 inches wide by 14 inches deep and 5.5 inches high, big enough for cable box and DVD player. The side cabinets are 7.5 inches wide by 12 inches deep and 21 inches high. The fireplace requires assembly and the total weight is 120 pounds. Assembly instructions and remote control is supplied, (without batteries, Grrrrr…our pet peeve). There were tons of compliments and comments about how great the fireplace looks. Many described it as “beautiful” while others said that it “looked great”. Some went as far as to say that they really loved the style of the fireplace and that it “looked classy”. The fact that there 2 color options helps match home decor. A lot of folks liked the flame effects and the burning embers. The realism was appreciated and the fact that both the flame intensity and the ember intensity could be adjusted was another plus. This makes adjusting the ‘cozy factor’ just that much easier. Many thought that the price of this fireplace was very good considering that it is a media console as well. There were other comments about it being good value for money when compared to other units on the market. You really are getting a muti use piece of furniture and entertainment rolled into one package. There were a number of positive comments about the heater and that it was able to heat rooms efficiently and quickly. Some said that their rooms were “warm and toasty” in no time with this heater. Most customers liked the capacity of the unit for storage and the fact the shelf runs the width of the unit. Also a plus – being able to handle a large TV. There is lot of room for media accessories and everything can be well organized in the side storage compartments. Yes, you do have to assemble the unit, but the plus is that there were a lot of customers who thought that the instructions were very clear. With that, it was a simple task to assemble it. Others said that the pieces fitted well together and overall the assembly was straight forward with simple tools. One customer complained that when the fireplace was delivered the color was not as they expected. This was certainly a minority view and should not be considered as a big problem. Take a good look at the colors. Another buyer complained of a funny smell from the heater again this was a solitary comment which does not reflect the overall customer view. In some cases there may be a protective coating on heater parts, the smell should disappear after a short use. A handful of people were not impressed with the build quality of the unit and were concerned that it would not be able to handle a large TV. Most people were happy with the robustness of the fireplace and there is ample discussion on Amazon from people who have used it for its intended purpose as a TV stand for a large TV with no problem. There were a couple of customers who said that their unit arrived with scratches. This could have been due to the way it was shipped and should not be considered as a fault with the fireplace itself. There may have been a problem with this particular unit and it should have been exchanged for a new one. Amazon is great about returns and exchanges. I got a chuckle from one buyer who was frustrated because the manufacturer would not accept it after he put it together and it was mysteriously damaged. Examine all parts before assembly, just in case. A few buyers felt that the assembly was difficult and took too long. The perception of assembly difficulty is going to vary from person to person and the majority of customers were satisfied with the assembly task. Most folks can unpack it assemble it and set it up with TV and their devices in about 2 hours. Taking all of the customer reviews into consideration there were 66% of 5 out of 5 star ratings. 27% were 4 out of 5 star ratings which combined gives a total of 93% of buyers who rated it very good or excellent, which is very high. This compares very well with other similar fireplaces available. The Antebellum Media Electric Fireplace really looks the part and provides good media storage functionality. The heat output is good and it will provide a very nice centerpiece for any room. This is certainly a recommended purchase. 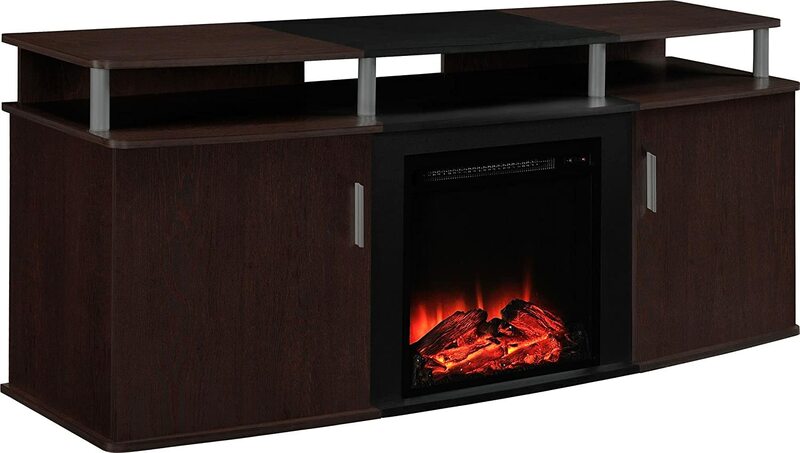 The following electric fireplace media centers have been comprehensively reviewed at Cozy By The Fire. Just click on the text link to go to the review. Clicking on the images below will take you to Amazon for more information and today’s lowest discounted price. In this review of the SEI Tennyson Bookcase Electric Fireplace will be examining all of the features that this fireplace has to offer. We will also look at the pros and cons which are taken from real customer reviews. Our aim is to assist you in making an informed decision to purchase. The SEI Tennyson Electric fireplace with bookshelves is a well designed and very good looking fireplace with the added convenience of individual bookshelves. It will provide a center piece for any room in your home or even in your office. It will provide a real ambience and make your room cozy as well. Yes, you can put a flat screen TV on the mantel top. 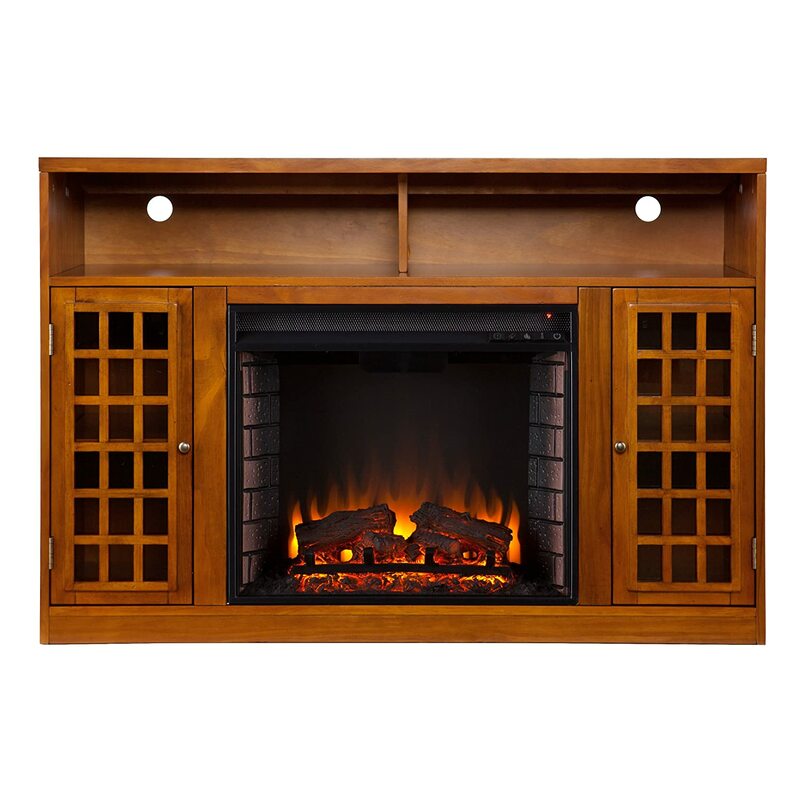 This free standing electric fireplace heater accommodates a flat panel TV up to 68.25″ W overall with a base up to 40″ wide. It can do double duty as an electric fireplace with book cases and an electric fireplace TV stand.It features 6 fixed book shelves. This fireplace really has a realistic looking flame effect with burning logs. The flame heights have five levels of adjustment and there is a backlight to really show off the whole fire effect. You can also adjust the brightness of the logs up to five levels. The flames are powered by long lasting LED lights that will never need replacement. There is no need to have the heat turned on with the flame effects; they can work with or without heat. It is also possible to turn off the flames and just leave the logs glowing. The tempered glass at the front should never be hot. The flame effects are very realistic and are totally silent in operation. It is not possible to change the color of the flames with this unit. This fireplace has a forced air heater with an adjustable and programmable thermostat. The heater is almost silent in operation, and will heat a 400 square feet room easily in around 20 minutes. The fireplace is cost effective to run only costing pennies per hour with the heater on. The maximum output of the heater is 1500 Watts at 5000 BTU’s. The temperature of the heater can be set using the remote control or the buttons on the fireplace. Once the desired temperature has been reached the heater will automatically turn off. The fireplace plugs into a standard electrical outlet, and because it is electric there are no fumes or smoke to worry about. There is a thermal overload protector built in for safety. There were a lot of positive comments about the heating function and many felt that the heating power was more than adequate to heat their rooms. The heater was described as being very quiet when it is working even when it is on the maximum setting. This fireplace has a set of manual controls located at the top right of the unit and it is also supplied with a remote control. There is an LCD display on the fireplace which will show the temperature or the operation of the controls (e.g. flame level 5). The remote control is full function – it can control everything on the fireplace. On both the fireplace and the remote there is an on / off switch, a switch for the backlight, a flame height adjustment control (five height levels), a log brightness controls (five intensity levels), a temperature control button and a timer button. The fireplace comes with a 6 feet long electrical cord and includes assembly instructions, remote control and user manual. A good number of customers were very happy with how the fireplace looks. Many said that the fireplace had a “nice finish” and others described it as beautiful and a lot of people really liked its classic lines. Quite a few people commented on how the fireplace was easy to put together and that the assembly instructions were easy to follow. Most said that they had the fireplace assembled in about an hour or two. A lot of the customers felt that the flame effects were very realistic. One customer said that they normally wouldn’t choose an electric fireplace but the fire effect with this one were so real looking that they purchased it. The supplied bookshelves were seen as a very useful addition and add to the overall look of the fireplace. A number of customers said that they chose this fireplace over others because of the bookshelves. It is really interesting to note that our survey of criticisms of the fireplace were on the exact same topics as the praise for the fireplace. It seems you either like the looks, or not. The bookshelves are too small, or not. It is easy to put together , or not. There were a handful of customers who did not like how the fireplace looked. There were a few comments about the finish of the product. These comments were certainly in the minority. A few of people complained that the fireplace required a DIY expert to put it together. Some said that it took them hours to assemble. This is contrary to the majority view. The skill levels of different people when it comes to DIY are always going to vary. There were a couple of customers who felt that the bookshelves that are supplied with the unit were too small. Most people were happy with the bookshelves and this is not seen as a major issue. Of the total number of customer reviews submitted for the SEI Tennyson Electric Fireplace, 51% of them were 5 out of 5 star ratings and 28% of the customers gave a 4 out of 5 star rating. This is a combined score of 79% which is very credible. This free standing electric fireplace will provide good ambience for any room in your home and the flame effects and logs are very realistic. 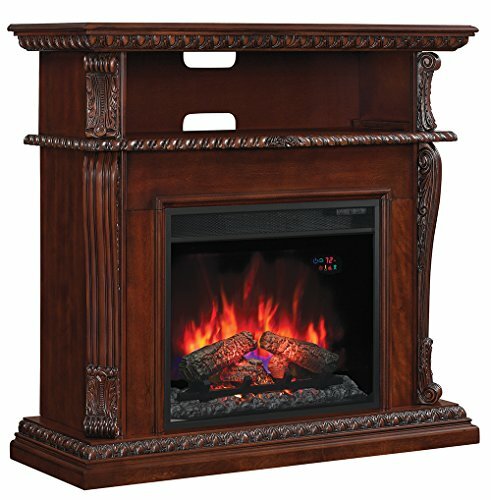 (if you are looking for a more simple electric fireplace and mantel surround check out the Crawford Slim Line. )The heater is very efficient and silent and the bookshelves are a welcome addition. This fireplace is recommended by us, it really is pretty. Are you considering buying an electric fireplace? If so, it will definitely help to take a look at our electric fireplace pros and cons.